I bought this book the moment it came out and have been dying to read it ever since. I thought perhaps I should brush up on the events of books 1 and 2, and I got halfway through my re-read of Into the Vast and then… I think I got busy, or we had visitors, and then I may have gone to the library and picked up a bunch of other books and sort of forgotten about it. And then I kept putting of Ascent because I really wanted to re-read the first two books, but re-reading books, even books I love, is harder for me these days when my reading time is so limited. Anyway, all that to say… I finally decided to just go ahead and read Ascent, because I couldn’t wait any longer (lots of self-control have I, when it comes to books!) Part of what brought on this decision was that I got to take a mini-vacation ALL BY MYSELF the first weekend of October to go to a friend’s wedding, and I had plenty of time during long layovers and in airplanes to get some serious, uninterrupted reading done. What bliss! So I spent much of my time reading Ascent of the Nebula by DJ Edwardson. Seriously, if you haven’t read this trilogy, you need to. It is so beautifully written and the story and the writing just get better and better with each book. I enjoyed Into the Vast, and I really liked Through the Viscera, but I can honestly say that I LOVED Ascent of the Nebula! I have been waiting for a very long time to find out who Adan is, and there were definitely moments in Through the Viscera where I feared that the author might hold out on us readers with this bit of info. However, Ascent of the Nebula does not disappoint, and I got a fully satisfying wrap-up to Adan’s story… both a glimpse of his future, and a good grasp of who he was in his past. There are of course some mysteries left with answers only hinted at, but on the whole, the trilogy is very neatly completed. The world of Nai (the name of the planet) is so well-crafted. Lots of thought and effort was obviously put into building it, and it was a true pleasure to return to that world and learn more about it and its inhabitants. There were plenty of old familiar faces, and a few new ones, as well. There were things in this story that made me laugh out loud (luckily, nobody could hear me on the plane). There were moments that reduced me to tears. And there were moments where I just had to pause and soak in the words because they were so true, or so poignant. One of the things I love about these books is how the author uses them to subtly point to God. Known as Numinae in the world of the Vast, there are many conversations about Him and who He is. And while they would be hard to miss, I never felt like they beat me about the head the way some can come across. Because of the nature of who Adan is and what he’s been through, much of the explanation-style conversations he has with others makes sense in a way it wouldn’t with another character. One thing I would not recommend… I would not recommend blitzing through the first 29 chapters, and then get so busy that a week goes by before you pick up the book again in chapter 30. Because I did that, and I got a little confused. You see… some of the characters’ names change rather suddenly in chapter 30… and since they don’t really realize their names have changed, there is no fanfare about it… and I wasn’t sure at first if I was reading about new characters or not. I did start to suspect what was going on rather quickly even so… but I think it would have been less confusing if there hadn’t been a week in between those particular chapters. Unlike some readers, it doesn’t bother me too much if a character changes his or her name partway through the book… and that does happen a time or two. So be warned. But it all happens for a reason and eventually makes sense. Truly. This is pure science fiction in its highest form. I tend to prefer my sci-fi a little bit closer to the fantasy end of the spectrum, but I cannot recommend this trilogy highly enough. If you enjoy sci-fi, if you love made-up technology that maybe, someday, could be a reality, if you love space battles and rooting for characters as they face overwhelming odds, if you enjoy the writing styles of some of the more classical sci-fi authors like Isaac Asimov and Frank Herbert, but you’d like to read that style of author from somebody who holds the worldview of C.S. Lewis and JRR Tolkien… then you really don’t want to miss these books! Five Dragon Eggs. No question. I will buy it……and read it! A reviewer can ask no higher praise. I hope you enjoy it! Great review — enjoyed reading it! And… now you’re making me really want to read this trilogy, even more than I had been! Methinks I have the first on on my Kindle app… now just to find the time to read it. I don’t usually read sci-fi, leaning more toward fantasy or fantastical sci-fi, but I have on occasion enjoyed regular sci-fi, not to mention that your recommendation comes highly, for me. Sounds like these are interesting! I really like them. The techno-jargon can get a little overwhelming at times (I remember that being a bit over my head in places in book 2) but the glossaries in the back of each book helped a lot with that whenever I forgot what a certain thing did. Thank you so much for this wonderful review. I’m so thrilled and humbled that you enjoyed the book. What you wrote here…it means so much. I really am at a loss for words to describe how grateful I am to you for sharing your thoughts. And thank you for taking the trip all the way from the Vast through to the Nebula. You are welcome. 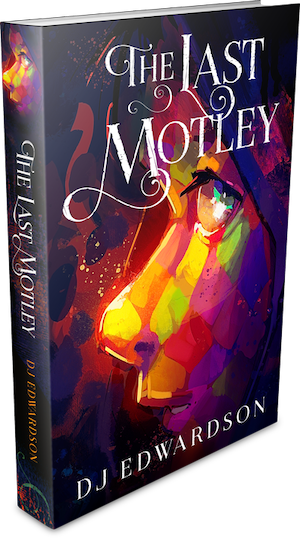 Now… when is Last Motley coming out?!?!?!?! Because I really am dying to read the finished version!!! Um…soon? It’s hit a bit of a snag. I hope to share what happened in my next newsletter. Stay tuned! Ooh, this looks like a great series! I might have to give it a whirl! Thanks! I really do enjoy this series a lot.